On the first Friday of the month our downtown area hosts an event called "Art Hop". Each business has the option of participating. An artist is chosen for each business and gets to have an exhibit of their work as well as pieces for sale. My friend, Nancy, who owns the restaurant "The Garden Gate Cafe" has asked me to be her artist for December. I was very reluctant at first but then agreed. I wasn't sure that I would have enough time to prepare. Sometimes a little push is what's needed and she provided that. So here is the first quilt that I will be selling. I'm calling it "Sugar Rails". 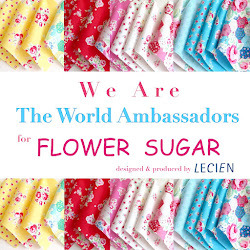 I have used some of my most favorite fabrics, everything from Lecien to Tanya Whelan, to Cath Kidston. 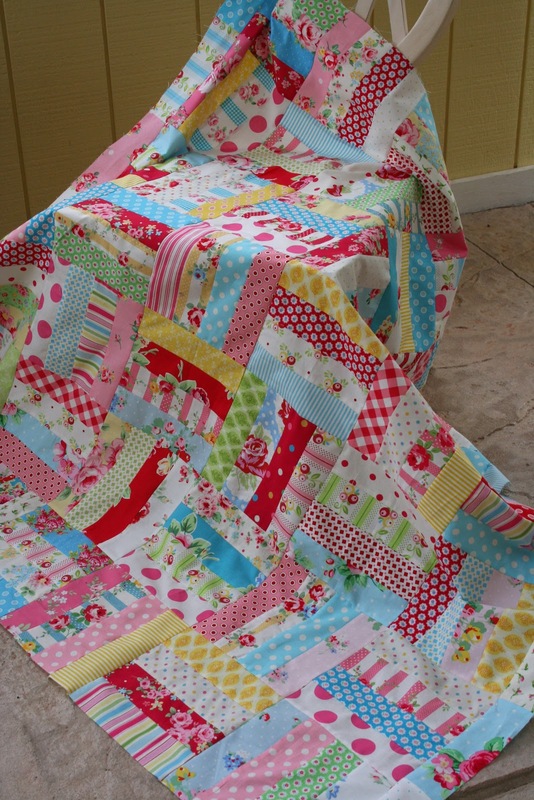 It's a simple rail fence block yet the fabrics make this quilt. Now to hand quilt or machine quilt? What do you think? So so pretty...love the colours and your fabric choices!!!! That is the sweetest quilt, Renee. I have so many of those fabric, but just can't bring myself to cut into them. This is the perfect way to showcase them all. If you have lots to do for the show, machine quilting would probably be faster, but you know me, I love hand quilting too. I know, no help at all. I really like the simplicity of this quilt, what is the size of the final block (if you don't mind sharing)? Did you sew long strips together, then just cut the blocks? The fabrics really speak to me, of course I like pinks and blues. I am striving to get three twin size quilts done but Christmas, and I thinking a simple design could help me accomplish this. Happy Quilting! I think that is luscious!!! Those fabrics are so gorgeous!! If you have time, I vote hand-quilt. So gorgeous! I love all the colors and the designers you name so this quilt is right up my alley. I also love finding beautiful quilt patterns that are super easy. I know I could do this. I sure wish I could come see your display! Oh love this one!!! Colors are grand! !